A few weeks ago, my family was getting together for one last reunion before my parents set off to Mexico. We needed to find an accessible location during Friday evening rush hour for people coming from Milton, Oakville, Toronto and Burlington both by car and by train. I suggested the new Oliver and Bonacini at Oakville Place. Conveniently located less than a five minute drive from the Oakville GO Station, this venue turned out to be the ideal choice for our last supper. I always get a bit nervous choosing restaurants for my family, because my parents are both ‘foodies’ who cook well and enjoy fine dining. So it was nice to impress them with this choice – a restaurant that is both pleasing to the appetite and not too heavy on the wallet. Although they have a mixed repertoire of food on the menu, it is primarily Italian, and they do their food very well. Most of us opted for seafood: tender scallops with artichoke and fresh parmesan, grilled calamari in a lemon brown butter sauce, and a scrumptious looking portion of battered fish and chips. 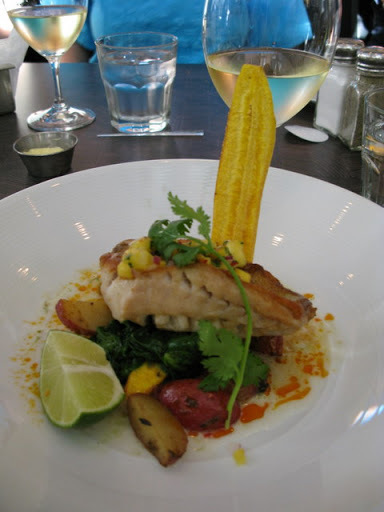 The special of the evening was a red snapper with jerk roasted potatoes, wilted spinach, pineapple salsa, and a plantain that served both decoratively and as an accent flavour to the rest of the dish. The service is also worth mentioning; our waitress was professional and charming, and attentive to our sometimes unique requests. And for those who are interested in the aesthetics and overall atmosphere of a restaurant, this gets top rating. In an industry where the trend has become low lighting and dark furniture (think Milestones or Moxie’s’ west coast influences), Oliver and Bonacini comes as a refreshing surprise. There are clean lines in white and silver, with darker accents in the seating areas. Birch and greenery dot the landscape, which is decorated with images of food and the environment it comes from. You can see part of the kitchen from the dining area: a high marble counter with low lighting in white and silver, and decorated with preserves and other food items, as well as recipe books in the shelves along the front. The atmosphere was a bit quiet for a Friday night, but perhaps it is because they are still building a reputation. I hope this recommendation brings them the busy nights they deserve! Well, ladies and gentleman, I have found it. The pizza crust that true pizza lovers dream about can be found at Pizzeria Libretto on Ossington. It’s thin, melts in your mouth, and has that natural taste that only real pizza ovens from Naples, Italy can bring. This pizzeria is the only certified “Vera Pizza Napoletana” in Canada, translated as a “true Neopolitan pizza” experience. When you taste pizza like this, you wonder how places like Pizza Pizza can even claim to be selling the same thing. They should be ashamed of themselves! Unfortunately, I’m not the only pizza aficionado who feels this way about Pizzeria Libretto. It is a hugely popular spot, so expect to be waiting at least half an hour to be seated. We went on a Monday, thinking we could avoid the line, but we still had to wait 45 minutes before we got a table. The convenient thing is, and it makes you wonder why every restaurant doesn’t do this, they take down your cell phone number to call you when the table becomes available. That way, you can go for a drink elsewhere while you’re waiting. And it’s worth it. Your taste buds will be satiated while you wait for the pizza, with fresh bread and olive oil with a dash of chilli spice. I sampled two pizzas: the “Hot Peppers” and the “Duck Confit”. The first pizza consisted of house made sausage, fresh basil, tomato, mozzarella in small concentric slices, and of course, hot peppers. Being a fan of spicy food, I will say that I could have taken the hot peppers a little hotter, but otherwise, the pizza was terrific. The sausage was fresh and had some kick to it, and I just couldn’t get enough of that crust. On the other hand, the unique duck confit pizza with pears and a white sauce was a sweet alternative to the more traditional tomato pizza, and the flavours were expertly combined. We ordered two bottles of red wine between six of us, and each ordered our own pizza. Even with the alcohol, it was a very affordable meal, at approximately $36 including tax and tip. The service is friendly, and they are gracious about taking any leftovers home. You might wonder how I avoided eating the whole pizza right then and there; it was challenging, but my will power paid off for a delicious lunch the next day. When the pizza crust is right, my favourite thing to do is fold the pizza over itself, for a multi-layered bite; my friend Nicole like to roll hers up like a wrap, and let the olive oil drizzle down. Whichever way you like it, Pizzeria Libretto will live up to your expectations. Pizzeria Libretto: 221 Ossington Ave., Toronto, just south of Dundas. Italy may have lost the qualifying game for the knockout stage of the World Cup, but it will always win when it comes to food. I have recently had a love affair with thin crust pizza, which all started after eating the finest specimen at La Bottega in Montreal in March (see article “Baguettes, butter and cheese…”). Now it has become a game of trying to find that pizza again. It is a familiar emotion for foodies everywhere – you sample something so delicious at a restaurant (this is usually coupled with a positive atmosphere and experience with friends), and yearn to relive that experience again. This is my dilemma and also my mission this summer: I am on the hunt for the perfect Italian pizza. This restaurant is situated in an area of Toronto called Dufferin Grove, and the front patio of Terrazza (which literally means “terrace”) certainly lives up to the name, as it is bordered by trees both coniferous and deciduous. It is charming in its modest size and strings of white lights hung across red brick walls, and the staff is friendly and accommodating. We ordered a fabulous pitcher of Sangria for $20, a great deal, and enjoyed the complimentary bread, olives and olive oil. As most Friday nights call for, we opted for two pizzas; the first, a classic margharita pizza with bocconcini, and the second, a spicy salami pizza with gorgonzola and peppers. They were both thin crust, delicious, and hit the spot, and the whole meal was very affordable, so I would definitely recommend this restaurant. Marcello’s (pronounced with a “che” sound), was recommended by someone who knows Italian food well, as her family is from Agrigento, Sicily. A group of us shared delightful seafood appetizers of calamari, both grilled and fried, and mussels in a tomato-based sauce. The flavours married well with the fresh lemon slices, and it was hard to resist both the appetizers and the fresh bread with spicy olive oil. Of course, in my desire to recreate my thin crust pizza experience, I choose the “Diavola” pizza with spicy peppers, spicy salami, olives, onions and mozzarella, which turned out to be very good. Although the spiciness caused me to pause a few times to wipe my eyes, the pizza was flavourful and had a nice crust, cooked just right. The staff was also very kind, and even let us bring in our own birthday cake, a rare treat in the restaurant industry. If you are heading to Vaughan Mills and are looking for a good dinner place, this would be a good, affordable bet. Despite my two very positive experiences at these restaurants, I still have not found the perfect Italian pizza. Is it out there? Who knows. I may need to return to Montreal, or even fly to Naples, to find out. But in the meantime, Toronto and the rest of the GTA will be my dinner plate as the hunt continues. Let me know if you have any restaurant suggestions for me to try out!